Agility course plans are made available to competitors in advance so they may familiarize themselves with the course layout. 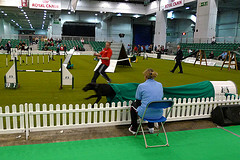 The agility equipment at competitions is the same but the layout of of the course will be completely different, this being the case handlers are allowed to walk or even run through the numbered course to acquaint themselves with the layout and plan how they will guide their dog through the course. Where to position themselves so that they can find the shortest route. The handler may not touch the the obstacles or the dog during the competition. No treats or toys may be used to entice the dog to complete the course, the handler must control and encourage the dog only by voice commands body movements, the dog must be alert to his handlers actions as the handler must have excellent understanding of his dog to be able to work as a team. As speed is an important part of the competition a good partnership and understanding is crucial to winning competitions. The agility course is set out by a judge using a standard set of obstacles the design of the course is entirely at the judges' discretion and may consist of several twists and turns, obstacles are numbered to show the order in which they should be completed, plans are often made available to handlers in advance of the competition so they may familiarize themselves with the route. It is crucial that the handler makes use of the walk through before the trial as the dog and handler have only one chance to complete the course without penalties and faults. Speed and accuracy are paramount particularly in higher level agility competitions. 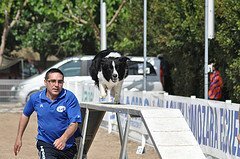 The scoring of runs is calculated on the number of faults a handler or dog makes by knocking down jumps etc and penalties for going over the predetermined time it should take to complete the course, as calculated by the complexity of the run, the level of competition and other elements.